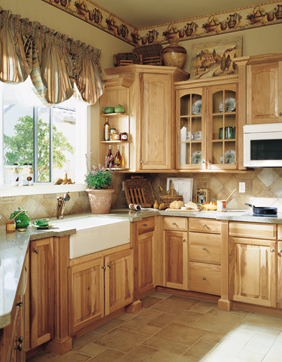 Cabinet fronts are made of finished hardwoods. 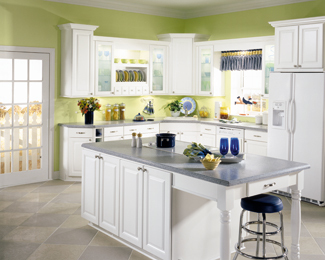 With proper care, the beauty and utility of your cabinets will last for many years. Remove splashes and splatters promptly to avoid permanent stains. Periodically, remove dust from cabinets with a soft lint-free cloth. The cloth may be slightly dampened with water or a spray type dust remover. Wood and laminate cabinet surfaces may be polished once every few months with a high quality, non-oil based furniture polish. Clean spills immediately. Use a clean cloth and mild soap if necessary. Wipe dry with a soft cloth. Do not use bleach, detergents, citrus or ammonia based cleaners, steel wool, soap pads or abrasive cleaners on your cabinets. These harsh abrasives will mar the wood finish. Additionally, the manufacturer recommends that you avoid the use of paste wax and polishes that contain silicone; the wax build up is difficult to remove and will leave a residue that attracts dust. In addition the interior surfaces of the cabinets should be cleaned periodically. There are a number of products available for your wood cleaning needs. See manufacturer recommendations for recommended cleaning products. Minor scratches can be covered with a putty stick that matches the finish of your cabinets. Putty sticks can be purchased at paint or hardware stores. Extra care should be taken that cabinet finishes are not exposed to heat in excess of 174° Fahrenheit. Do not place or mount small appliances beneath your wall cabinets. These appliances (such as coffee makers and toasters) can produce excessive heat, which can damage the finish of your cabinets. The wood in your cabinets is a natural product. It is subject to drying and can warp. This could cause drawers to stick and prevent doors from closing properly. Over time, it is normal to have some separation between countertops and walls. Caulking should be used to seal water out of places where it can cause damage and separation. Ultra Violet light rays in natural sunlight may affect the appearance of your cabinets over time. The finish on your cabinetry will not change, but the wood may, depending on its natural characteristics, the amount and direction of light exposure, and the portion of the cabinet that receives light. You can use any commercial glass cleaner to clean the glass. Additionally, the glass can be cleaned while mounted on the door, or can be removed for better access. While cleaning mounted glass, be careful not to damage the finish of the door and cabinet parts while cleaning. To remove the glass panel, carefully loosen the screws and lift panel out. The door glass is tempered to resist chipping and shattering. However, all glass is fragile so handle carefully. Do not spray glass cleaner directly onto glass or cabinet parts. Glass cleaner seeping into areas behind the mullions may discolor the wood. Instead, spray a small amount of cleaner onto a lint-free cloth or paper towel, then wipe the glass.